Mamata Banerjee , who has been breathing fire at BJP leaders after Madan Mitra was arrested in the Saradha scandal, was remarkably mellow during the day. 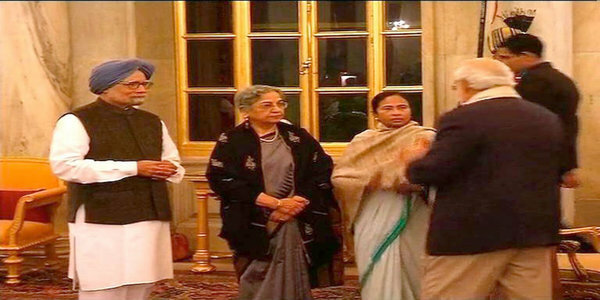 On Friday night, Mamata Banerjee came face to face with Prime Minister Narendra Modi at a banquet in honour of the visiting Bangladesh President, Abdul Hamid, at Rashtrapati Bhavan. The irony was not lost on Trinamul leaders: the chief minister, who was trying her best to avoid Modi, ran into him in her hour of adversity at an event she would not have been invited to had she heeded the original advice of the President’s office. 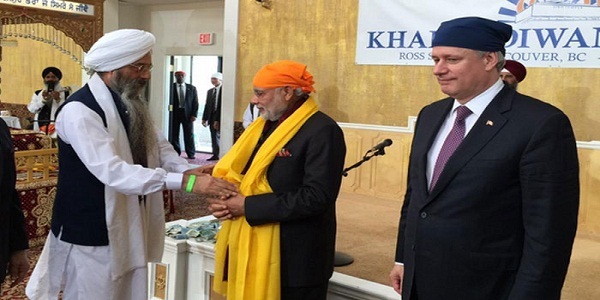 Television pictures showed Modi walking up to Mamata who was engaged in a conversation with Sushma Swaraj, Manmohan Singh and his wife Gursharan Kaur. Modi lifted his hands, to which Mamata responded immediately. Sushma was seen intervening with a smile. At the dinner table, Modi and Mamata were seen sitting across each other, sources said. “Mamata and Modi broke bread,” a Trinamul leader said after the meeting. Mamata, however, told her party colleagues that she hardly had any food at the banquet. The menu included shorshe maach (fish cooked in mustard paste), doi maach (fish prepared with curd) and maach bhapa (steamed fish). She returned to the official bungalow of Mukul Roy to have food with her MPs and friends. Mamata also met President Hamid and is learnt to have said that she loved Bangladesh.